Synopsis (from Goodreads): Having survived a near fatal accident, George is left reeling with the difficult questions of who he is and where is his family. Finding himself lost and in desperate need of help—in more ways than he realizes—George finds sanctuary at a mysterious diner he stumbles upon, only there to be plagued by more questions demanding answers he cannot satisfy. Through the help of a curious barista who is able to explain the metaphysical journey and the truth about who George is, he is taken into a world of understanding unlike he ever imagined possible—and receives the answers he has been waiting for his whole life. Sooner or later, we must all ask similar questions about life and the present path we are on. Journey with George in this fast moving, inspirational story that will awaken the desire to understand life on a deeper level and leave you with answers to life's hardest questions. The youngest of five, Elijah G. Clark was born in Atlanta Georgia and raised in Delaware. As a member of the United States Air Force, Elijah first heard the calling of God in his life. He was lead on a mission of finding purpose, love, truth and peace. Throughout his journey, he was eventually lead to building a personal relationship with God through study, meditation and prayer. After completing his service in the military, Elijah attended college in Pittsburgh, Pennsylvania where he also married Anastasia in 2006. Two years later, Malachi was added to the family. As a storyteller, Elijah is known for articulating his messages with fascinating truth and parables. His desire is to be used by God as an interpreter of His message. I liked the general tone of this book, however, the idea itself wasn’t necessarily original. It was like a combination of the book The Shack and the movie The Encounter. If I hadn’t read or seen either of these, I probably could have savored it a lot more. It has a great message and the potential to be a great book that can be very inspiring for people, but like previously stated, the writing itself could still use a bit more work. I was still interested in the storyline despite the familiarity. I hope the author continues to pursue writing in this genre, and I look forward to seeing more original work from them. I liked the format of the chapter titles with the taglines that provided a vague preview of the chapter to follow. 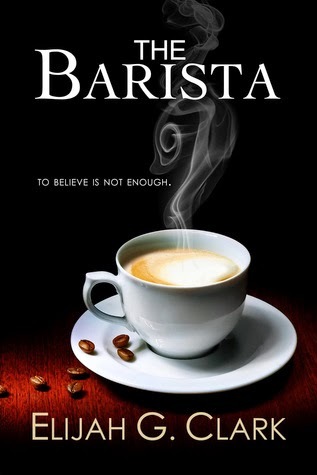 However, the main title of The Barista didn’t necessarily seem to fit since the setting was in a diner and not a coffee shop. I thought the length was great. I’m used to reading books much longer than this, so this was a nice, light read. I felt the style of writing could use more development. At times the author was wordy or repeated themselves. There were also passages that became confusing and could have been organized better. At first I was very upset with George’s character. I thought he was impulsive and self-indulging with little consideration for others. I felt awful for his [ex] colleague Steve for first stealing away the hard work he had spent previously learning George’s pitch, and then leaving him stranded to go after his family when Steve, I’m sure, had family to be concerned with in the same area. I wish this part was resolved, but then he refused to return to the meeting. I feel like Steve pulled so many strings for him and he was just ungrateful. I guess if the author’s intention was to spark frustration at this, they succeeded. But there were many parts of the story that were emotional or ignited interest in the point Emmanuel was implying, the details of George’s past, and what was to be expected for the future. The scene where Emmanuel asks George what the basis was for becoming a father was a good parallel to the intention and character of God. George explains that him and his wife felt they were “ready” for children, to which Emmanuel responds, “ready for what?” We have this internal instinct to give life, grow and mentor a family. It painted a realistic picture of God’s disposition and relation to us as our father. There were moments where Emmanuel seemed unconventional or flaky, and I didn’t find this to reflect Jesus’ character very well. However, his way of communicating through story and emotions reminded me of Jesus’ parables. Near the end where he was rejecting George’s plea for forgiveness seemed a little unscriptural. It’s hard to pick a specific moment that stuck out to me. The majority of the book was very weighty and tackled many issues and provided many simplified ways of explaining the sovereignty of God. The ending was appropriate, but it made the beginning of the book confusing. I understand that George hadn’t let go of losing his family, but to actually have a conversation with them and be under the impression that they were physically there was just a little confusing. Altogether, I received a renewed sense of understanding of who God is and how we so often picture God as this far away being when, in actuality, He’s closer than we think. I think this book needs a lot more work and more original content. The author often repeated themselves and the grammar wasn’t always well-constructed. There were also a few spelling errors (ie the beginning of Chapter 12 it should say SHOCKED and confused, not shock and confused).